1 The full population picture doesn’t tell the whole story. If you look simply at the total percentage of online adults who say they trust a news organization for news about government and politics, several mainstream television outlets rise to the top. CNN, ABC, NBC, CBS and Fox News are all trusted by more than four-in-ten web-using U.S. adults. These high numbers, though, are intertwined with the fact that more than nine-in-ten respondents have heard of these five news sources. Trust and distrust were only asked of sources respondents had heard of, thus, the better known a source is, the more Americans in total who can voice trust or distrust of that source. A source like The Economist, on the other hand, is known by just 34% of respondents and so could never have a trust level exceeding 34% — even if everyone who had heard of it trusted it. 2Is a news organization not trusted? Or just not well known? An alternative way to analyze the data is to look at the percent of trust among those who have heard of the news organization. This approach means that lesser-known outlets may be seen as equally trusted as better-known outlets. By this metric, several of the best-known sources sit toward the top, joined by some less familiar sources. NPR, for example, is on par with many of the mainstream television outlets on this measure. 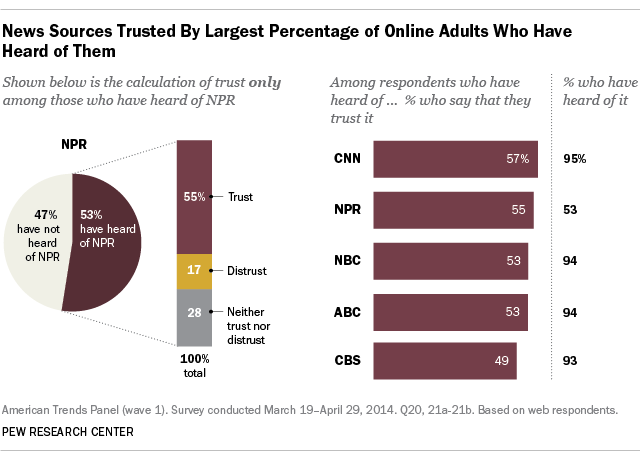 Among the panelists who have heard of NPR, 55% trust it. The same is true of 57% of those who have heard of CNN and 53% of those who have heard of NBC and of ABC. 3 What about the ratio of trust to distrust? 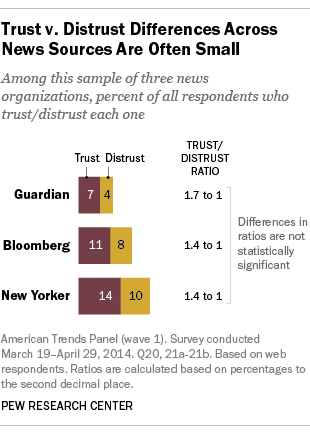 Another way to think of trust is to compare trust and distrust in a news source. 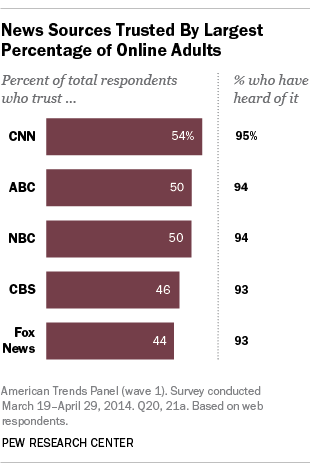 In other words, what is the ratio of people who trust a news outlet to those who distrust it? This ratio is based just on those who have rated the sources as trusted or distrusted, regardless of how well known the source is. 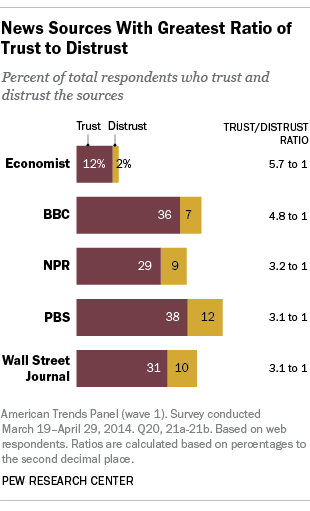 The result is a different list of news brands: The Economist, BBC, NPR, PBS and The Wall Street Journal are among those with the highest ratio of trust to distrust – even if the overall percentages of those who trust them are smaller than for some other sources. Only 34% of online Americans, for example, have heard of The Economist, but there is far more trust (12%) than distrust (2%) when it comes to news about government and politics (20% neither trust nor distrust The Economist). The BBC is recognized by a greater portion of respondents (76%), but is similarly more trusted (36%) than distrusted (7%). 4 Beware of drawing distinctions. They may not be significant. Any effort to draw distinctions between different news sources must keep in mind that survey data are subject to a margin of sampling error, and one should use appropriate caution. We will not characterize one source as more trusted than another if the differences between them are so small that they could have occurred just by chance as a result of sampling error. Moreover, many small differences may pass a test of statistical significance but be substantively meaningless. This is the reason why, in the graphics that you see in our report, we group sources in broad categories such as “Sources Trusted by more than 50% of Panelists” and “Sources More Trusted than Distrusted.” For example, The Guardian, Bloomberg and The New Yorker sit next to each other in the “more trusted than distrusted” section of the adjacent chart. Statistically, their ratios of trust over distrust are equivalent (1.7, 1.4 and 1.4, respectively).